One beautiful morning in Florida I received a phone call from United Cerebral Palsy of South West Florida Day Center asking for volunteer yoga teacher to teach yoga classes to intellectually disabled people. I had a little experience working with Autistic kids and adults, and I was very excited to experiment how yoga tools can be applicable and beneficial for the people with intellectual disorders. I did my homework by researching about diseases that individuals were diagnosed at this Center: Cerebral Palsy, Down’s Syndrome, Autism, Pervasive Development Disorder and Spina Bifida. With set appointment time on the following week a senior teacher of Florida Yoga Academy, Giedre Avellino and I went to the center. It was heartbreaking to see people lying on the special mattresses, in the wheelchairs blankly gazing to nowhere. Some individuals were doing crafts and drawings. Employees of the center were taking care of and interacting with the participants, but the atmosphere in this Center was very sad and cold. It was very challenging to stay balanced and calm at this place. I wanted to hug each of them and warm them up with all my love. Tracy showed us the center and we chose the “quiet” room to start our Yoga experiment. Our Yoga room had no doors and curious participants of the center were interrupting our private classes constantly. Volunteer students were coming to meet us one by one. We asked questions, observed and tried different Asanas, Pranayama and Chanting. We noticed that participants have fear of meeting new people and trying new things, most of them were overweight, breathing was very poor and mostly their speech was affected, or they didn’t speak at all. Attention spans of our students were very short, yoga lessons were about 15 minutes long. We applied simple yoga tools addressing observation we noticed: Asanas- Tadasana, Virabhadrasana, Trikonasana, Uttanasana, Pranayama with arm movements and chanting OM. Each participant received a sheet with the written class instructions and promised to practice yoga at home every day! Finally, a girl in the wheelchair was brought to the yoga room. I look to Giedre with question in my eyes:” What practice can she do? She cannot move or speak. Also she is under strong influence of medication! What Yoga tools can we apply to this girl?” I gently touched her hand and she pulls it away. She didn’t like my touch and I saw fear in her eyes. My thoughts were jumping in my mind: “She cannot talk, so she cannot express herself, communication is associated with Vishuddhi Chakra – the tool of Yoga which balances this chakra is chanting!” Very gently Giedre and I started chanting OM. I noticed interest in her eyes. We continued chanting. After a few minutes listening to our chant and the girl fell asleep! Later we had a few more participants in the wheelchairs brought to our yoga room for practice. The same tool of Yoga was applied each time: gently chanting OM. A week later, we came back to UCP of SWFL to continue teaching yoga therapy classes. Employees of the Day Center met us with a lot of excitement asking what we did with the participants in the wheelchairs last week, because they were unusually calm during that day, some of them were sleeping! Listening to 5 minutes chanting had a big calming effect on those people! We went to check how our mobile students practicing Yoga Therapy individually. But this group was not doing so well. All of them lost their sheets with the home practice and probably did not practice at home at all! I decided to change strategy and try group yoga classes. But if I want this program of Yoga Therapy to work, participants have to be guided every day, or at least few times a week. I talked with my Therapeutic Yoga Teacher Training trainees Linda Bambi, Eddie Colon and my senior teacher Giedre Avellino about this project. I was blessed with enthusiastic agreement to help and volunteer to teach Yoga at the Center! 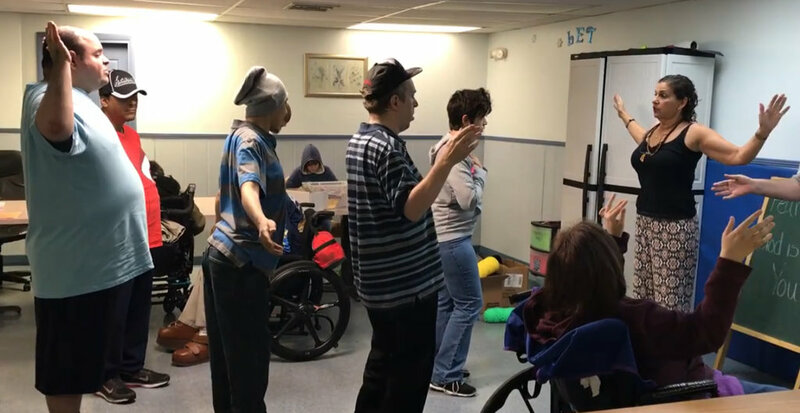 A Yoga Therapy program was set up and Therapeutic Yoga group classes started at United Cerebral Palsy Center few times a week! Classes included the same yoga tools of Asana, Pranayama, and Chanting. There were ups and downs teaching at this center but after two months of practice, I interviewed students, employees, and teachers working with the students, as well as parents to collect information about their observations and noticeable changes that happened with the yoga students. Ramel, student stated that he likes practicing yoga and his headache disappears after yoga class. Tracy, an employee of the center noticed that yoga students look more relaxed, have fewer conflicts, less agitation and that anger control is better. She said that one of the yoga students sat in a corner after yoga class and did everything from the class! Linda Bambi, yoga teacher thinks that this is a great opportunity for participants of this center to express themselves, to show their gifts and to make themselves feel better. She believes that with guidance and patience everything is possible! Willie’s mom said that her son’s breathing is improved. Giedre smiles, noting how some yoga students at the center rush into the room for yoga class, or couple will “escape “ this “boring exercise” time for a potato chip snack…Many of students are participating with more confidence in each movement, and some are so excited to reach the floor in Uttanasana. Yoga class group’s togetherness, calmness, and chanting of the Om (for some students it comes as Uuu or Aaa) in indescribable ways touches not just participants of the group yoga class but the ones working on their crafts, naps or snacks by the table. Florida Yoga Academy is continuing working on this project and is very thankful for UCP of SWFL for this unique opportunity. We are very happy that from February yoga students from UPC of SWFL Center will be coming to our yoga studio for their practice, were will be fewer distractions, beautiful surroundings and it will be a reward for the people who were participating in yoga classes regularly as well as encouragement for the others who didn’t want to do yoga.